Clerkenwell is home to more creative businesses and architects per square mile than anywhere else on the planet, making it truly one of the most important design hubs in the world. Clerkenwell Design Week, now in its 9th year, creates a showcase of showroom events, exhibitions and special installations that take place across the area. You can check out all the locations and events in the online map, which is available to download. 25 food and drink partners around Clerkenwell also participate offering a variety of discounts and deals. Clerkenwell Design Week takes place 22 – 24 May in various locations around Clerkenwell. This week, the streets of Chelsea will once again come to life with incredible floral installations for ‘Chelsea in Bloom’. Extending the iconic RHS Chelsea Flower Show out into the local neighbourhood, the theme this year is ‘Summer of love’, inspired by the Royal wedding. Over 60 retailers, a record number, will take part this year creating stunning displays made of fresh flowers, setting Chelsea in Bloom 2018 to be the most exciting and visually powerful yet. You can pick up a free activity map on Sloane Square guiding you through all the installation or, for a truly romantic journey, book yourself a complimentary rickshaw ride departing every half hour between 10 am - 5pm. In celebration of the 100th anniversary of the UK’s women’s suffrage and Women’s History Month, three of the world’s most famous female-led operas have been dramatically revised with their stories told through the eyes of composer and interpreter, Pamela Tan–Nicholson. TriOperas portrays the three of opera’s most famous women – Turandot, Carmen and Madame Butterfly - as reluctant heroines generations ahead of their time. Turandot is a cross-dressing daredevil warrior-princess, Madame Butterfly is an ambitious and proud Japanese geisha, and Carmen, the free-spirited Spanish gypsy party girl. This innovative production, which challenges conventional depictions of the female protagonists, features a glorious fusion of classical music, musical theatre, circus, martial arts and dance. TriOperas opens at the Peacock Theatre on 23 May for a limited season until 1 July. 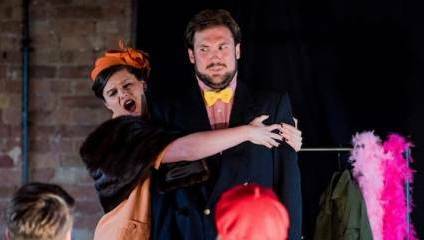 Meanwhile, Pop-Up Opera are back in town with a special Mozart double bill – Der Schauspieldirektor and Bastien und Bastienne – two lesser known works which showcase Mozart’s inimitable style and sense of playfulness. These two entrancing one-act comedies allow for a closer study of Mozart’s oeuvre as it explores two works written at very different times in Mozart’s life. Pop-Up Opera will perform at London’s Museum of Water & Steam on 22 May, the Bethnal Green Working Men’s Club on 23 May and Asylum Peckham on 27 May. Hayman’s of London are opening their doors to cinema and gin lovers everywhere, turning their distillery into a gin-themed pop-up cinema for the long May Bank Holiday weekend. With a series of five films shown over five evenings, guests can enjoy True English Gin in cocktails inspired by the film on-screen, all in the heart of a working distillery. Welcome drinks commence at 7pm before the film programme which includes classics such as The Great Gatsby, Casablanca and Breakfast at Tiffany’s. The Ginema experience takes place from 24 – 28 May. Full programme and booking on the Hayman’s website. Tickets are £35 and include two cocktails and London Dry Gin popcorn. For the true David Lynch fanatics, the Freud Museum is hosting a two-day conference exploring the cinema of David Lynch through a psychoanalytic lens. Lynch creates strange dreamscapes populated with bizarre characters, obscure symbols and an infuriating lack of narrative consistency. Yet despite their opacity, they hold us transfixed. You can dig deep into the Lynchian enigmas through a series of panel discussions and lectures with experts and academics from the fields of film and psychoanalysis, and muse intellectually about the true meaning behind Twin Peaks or Blue Velvet. Freud/Lynch: Behind the Curtain takes place at Rio Cinema 107 Kingsland High Street on 26 and 27 May. Tickets are £50 per day or £90 for the full weekend.